The bones of the hand and wrist provide the body with support and flexibility to manipulate objects in many different ways. Each hand contains 27 distinct bones that give the hand an incredible range and precision of motion. The forearm's ulna and radius support the many muscles that manipulate the bones of the hand and wrist. Rotation of the radius around the ulna results in the supination and pronation of the hand. These bones also form the flexible wrist joint with the proximal row of the carpals. There are eight small carpal bones in the wrist that are firmly bound in two rows of four bones each. The mass that results from these bones is called the carpus. The carpus is rounded on its proximal end, where it articulates with the ulna and radius at the wrist. The carpus is slightly concave on the palmar side, forming a canal known as the carpal tunnel through which tendons, ligaments, and nerves extend into the palm. Its distal surface articulates with the metacarpal bones, which are joined to the carpus by the palmar carpometacarpal ligaments. The five long, thin metacarpal bones of the palm extend from the carpus to each of the digits of the hand. 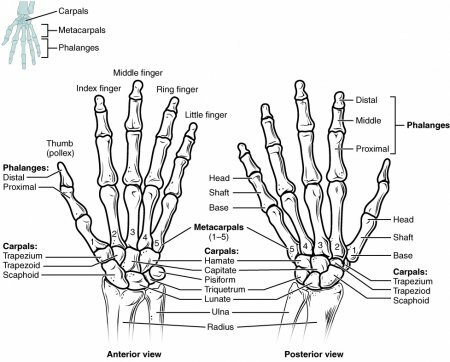 Each metacarpal is numbered I to V with metacarpal I connecting to the bones of the thumb, II connecting to the index finger, III connecting to the ring finger, and so on. Movement of the metacarpals by tiny muscles in the hand allows the palm to be stretched, compressed, and folded as needed. The distal head of the metacarpals is rounded to form a condyloid (oval) joint with the phalanges of the fingers. These condyloid joints allow 360-degree motion of the fingers at their bases. Each of the digits of the hands contains 3 phalanges (singular: phalanx) except for the thumbs that contain only 2. The phalanges are long, slender bones that form hinge joints between each other. Phalanges that articulate with the metacarpals at the base of the digits are known as the proximal phalanges. 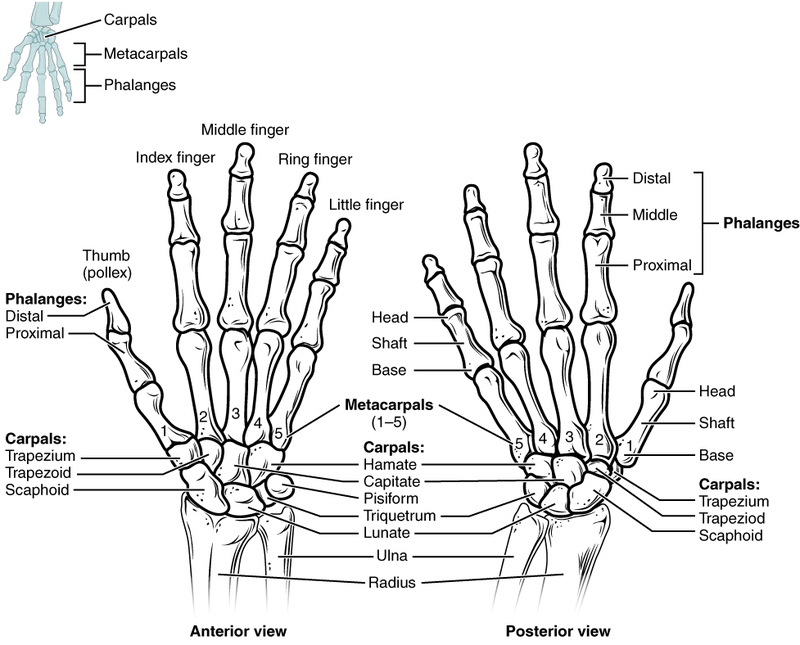 The phalanges at the end of each digit are called the distal phalanges. In all of the digits except for the thumb the middle phalanges are found between the proximal and distal phalanges. Muscles in the forearms flex and extend the phalanges by pulling on long tendons that run through the wrist and hand.